I am always intrigued by what happens to a piece of writing when it moves across different platforms. Sometimes, we use the term “transmedia” to describe a piece of media or writing that unfolds in different spaces, all in the service of a larger story. I’ve done different experiments myself with this, and have yet to be completely satisfied with the results. As part of a continued conversation about digital writing and digital making with a bunch of online friends, I wanted to try to make a poem “jump” from space to space, allowing it to unfold in pieces. I used my own blog as the starting point and ended up over in Mastodon as my ending point, and in between, the poem moves from Flickr, to Twitter, to Vimeo, to another writing blog space. Sometimes, the links to move forward to the next line of the poem are in the comment bin. Sometimes, they are part of the post. I was not trying to be tricky with it. I wanted the path to be clear to anyone bothering to try to read the piece. The most difficult part was coordinating the links to become live at nearly the same time, and it was sort of like setting up dominoes. If one piece with links wasn’t live, I could not have the link to connect with the previous and the next one. I worked backwards, and then sideways, re-posting some of the pieces a few times to ensure it all worked. At one point in the poem’s construction, my plan was to have the path go through the comment bin of either Anna or Sheri’s blogs, but when I tried, I think they either have comments on moderation (which is understandable) or maybe my posts got sent to moderation (due to embedded links) and they were not visible, so I could not get the link I needed to keep the poem moving. I became impatient, not knowing if Sheri or Anna might even be around to see and release the comments. This become an invisible logjam. I eventually went an alternative route (and reached out Sheri and Anna to let them know to ignore anything I had left behind), although I feel as I missed an opportunity to use another person’s comment area as part of the poem’s architecture. The poem would have been stronger by moving through other people’s posts, I think. This was a missed connection, so to speak. What I wasn’t so successful at here, I think, is really harnessing more of the possibility of each platform in some way. I did make the Flickr jump visual and the Video is a video of word animation, but maybe I should have added an audio component, for example, and the Twitter jump might have been better with additional tags, spreading the poem further. 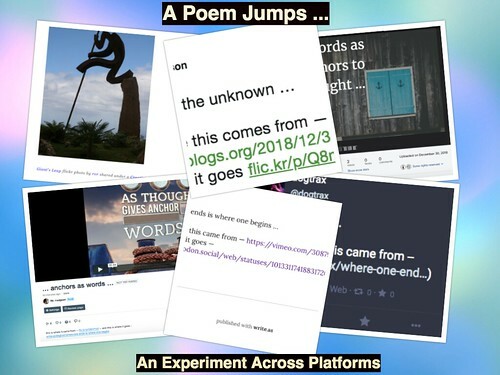 The two blog jumps — here, at this blog, and at another, where I write poems — are just places with links (although I did add a visual to the first jump), and maybe finding a way to add an interactive element (of some sort) would have been interesting. Landing on Mastodon made sense for me, as I write small poems there every day with a few others, but you would not know that by the landing point. Small projects like these are learning adventures, though. As a writer, I wonder how a piece can make that leap, in ways that allows platforms to inform and deepen the meaning of the words. As a teacher, I wonder how this might be taught in the classroom with young writers, and maybe .. why. Here’s what I think as I mull on that last point — the why would one even bother to do this? It becomes clear that in the process of doing this, you are forces to learn more about each platform as you consider its use as a jump point, that the considerations about possibilities make visible the limitations and the advantages of each platform space — and maybe open the door to unknown workarounds — that only surface when you see the collection of platforms as one larger compositional space, like an artist sees a canvas. Inside a post the other day, Sheri shared a previous project of hers, in which she used a sketchbook to draw a line into a story of art. I was intrigued by her call at the end of her story (which is part of the Sketchbook Project) for others to join her. 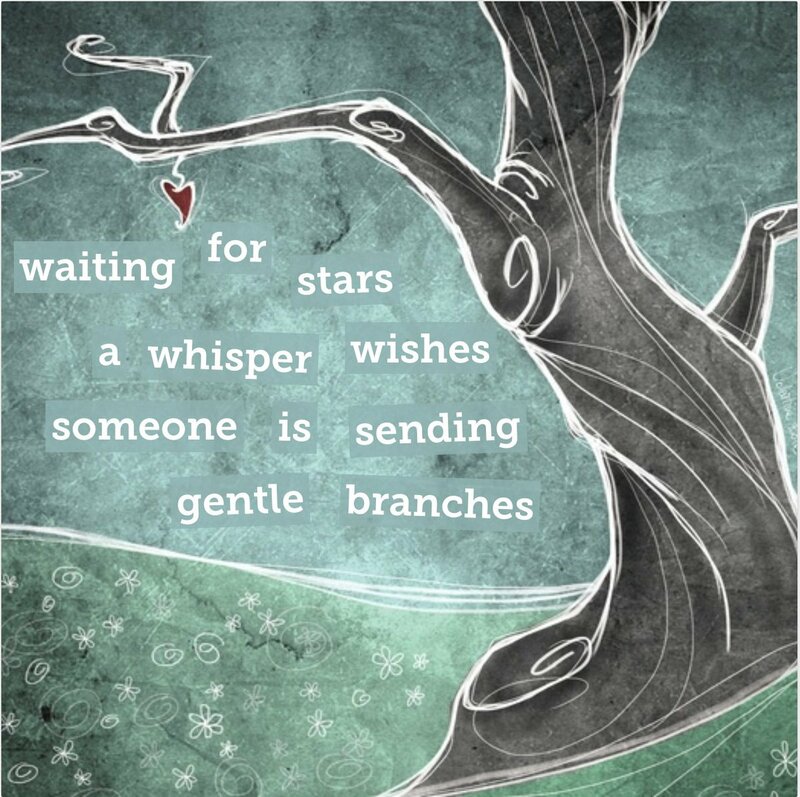 Even though the call was from five years ago, I tried to answer it with words via Storybird and its poem creation tool. Last night, I was still thinking of Sheri’s work in her sketchbook and mulling on the idea of lines as connectors. So I went back into Storybird and decided to use it to create a longer piece — a picture book this time — of how lines connect to writing, connect to people, connect to us. 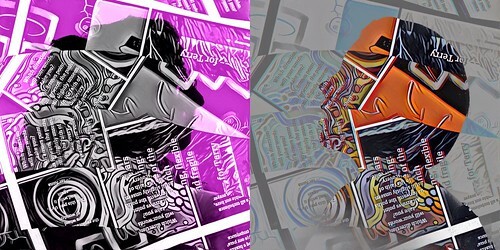 I started the book with the same image/artist as tapped for the above “magnet” poem, and built out from there. Storybird is interesting because of the way it upends the traditional writing — where words often inspire image. In Storybird, image and art inspires words. You choose a keyword or a specific artist (as I did here, with Flapperdoodle as artist) and Storybird generates art for you. 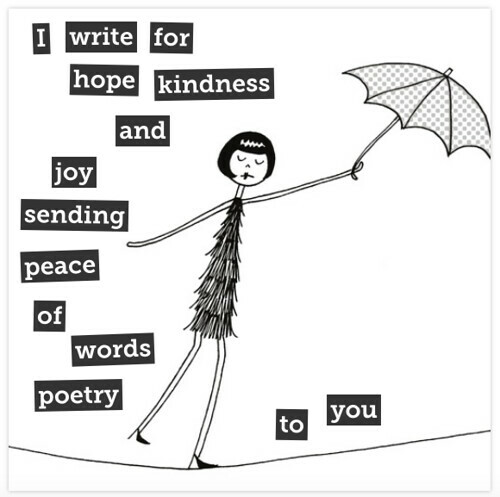 In the case of its poetry section, you choose an image and then are given a bank of words. This is something Anna noticed when she did a poem there. Constraints both hem us in — we can’t do what we wanted to do — and force us to edit or revamp or find a workaround, and sometimes, this is what gives a piece a different feel. Constraints force us out of our comfort zone. That’s not always a bad thing. Anna’s poem is beautiful, despite her narrow options for expression. I admit that I did not have much of a plan when I started Where the Writing Comes From, other than finding art with lines and being inspired by Sheri. Still, the story emerged as I imagined a narrator wondering about her writing, and then she shifts from herself as the center of her story to another as a larger narrative, seeing how worlds intersect with each other, and ending the piece with her writing the story I have been writing about her. A poem, then, that emerges from a blog post of a friend. This is where this poem began … consider these words as my process notes, my thinking out loud about my compositional intentions, a trail through the act of composing, as best as I can recall it. Anna inadvertently, perhaps, starts the kernel of this poem off with a blog post — Nothing to Write Home About — as part of her effort to write every day, noting that ‘writing’ is different than ‘blogging’ and she has been busy, with a newborn baby. She’s been writing but not necessarily for the world. For herself. Maybe for her baby. Her musings strike a chord. New found appreciation of warped time…..yes I know that one! Thanks for the fragments #Modigiwri Thinking @katevideo might like this post. Like a tweet comment from Wendy after she read Anna’s post, I am thinking of how Anna re-frames time in her piece, and I suddenly remember those nights with a newborn in my arms, snuggled in the deep hours of the morning. The weary mind but the full heart of the connection. A memory of me, new dad in the night, with my firstborn son in my arms, looking through the window at a deer slowly walking down the street, so quiet, so peaceful, and the magic of that moment comes to mind. One line of Anna’s piece resonates with me, and as I turn it over in my mind, a poem emerges. So, I write it for her, on the spot and in the moment, as a comment to her blog post, and I leave the poem there for her, another trail of words in an ongoing conversation around digital writing. She’ll find it when she wakes and has a moment to look, I think. Then I realize, there might yet be more done with this poem for Anna. Our discussions as a group around writing digitally often have us considering media and mediums for expression, and poetry opens up all sorts of corridors, does it not? I pull the words of the poem forward, from the screen and into Lumen5, which is an online digital storytelling tool, and I begin the harder work of representing the words of the poem in visual and with music. While Lumen5 auto-fills pages with images, I find they don’t work for me, they are not deep-sky-night-sky-slow-time enough for my purposes, so I dig down, deeper, searching for how to represent the poem’s pieces, bit by bit, phrase by phrase, idea by idea. 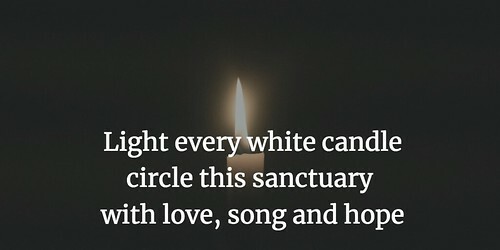 The poem’s visuals should represent the night, but also, the coming dawn. The images should tell the story of time, not clock-time but parent/baby-time. I haggle with myself endlessly as I do this — does this work? Does it not? Why? Why not? Where does one line of a phrase end and another begin? What am I trying to say here? 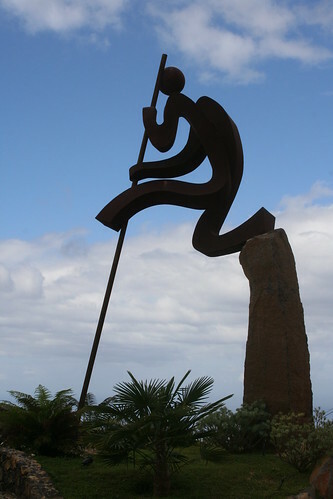 Does this image complement or contradict that meaning? I conduct this internal argument — the writer of me engaged with the audience of me — rather automatically now. I wonder if experience with digital tools makes this compositional work easier or harder? Am I more of a critic of my choices or is my experience allowing to narrow decisions? I am only now, later, here in the writing of this that you read, pausing, to think about what I was thinking. I’m writing it down to remember it. My search for the poem’s underlying music beneath the chosen images and text seems even more difficult. I want an open musical piece, something to represent the big sky wondering of a parent and baby in the quiet night, the near-sleep dreaming and wonder of it all. I try out more than a dozen songs — auditioning them for the poem, asking the music to bring its best bits forward — and finally find one song that has both intimacy and grandeur. Or enough of both for me to live with. Side note of thinking: what if I had chosen the music first and images, second? Would that have made the poem’s digital presence different? Would the music have guided my decisions in visual choices in ways different than doing it in silence, knowing music would be the last piece? How did the decisions I made about visuals impact the decision I made about music? Interesting. 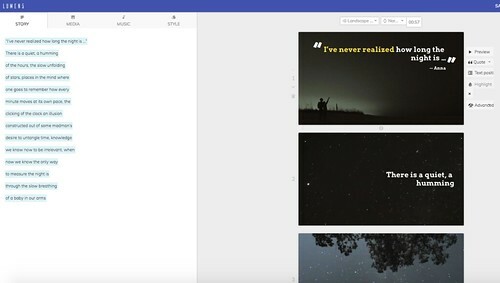 I choose the music, create the file in Lumen5, then download it and then upload the new version of the poem, sharing the video poem via Twitter in the morning through the #MoDigiWri hashtag, and I wonder if Anna will see it. I hope she sees it. Others make nice comments but Anna is my audience, and when she makes mention of the poem later in the day, I smile and feel satisfaction and joy at the gift of poetry. What we do with words matters, right? This is becoming a regular story of mine, and probably yours. An app that I really liked using for writing and making digitally, and on which I relied upon regularly, seems to have gone dead on me. Its name is Legend, and it was an animated text app that Terry Elliott turned me on to long ago. And I loved it on my iPad, for its simplicity and its design and the way you could easily find Creative Common images via its Flickr connection and then layer short text on top of the image. I used Legend for poetry and for quotes, and for merging words with motion and image. It was my go-to app for many things. And now Legend is gone from the App Store. Vanished without a trace. I was having some troubles with Legend on my iPad the other day, and I deleted the app in hopes of re-installing and re-booting it, and soon discovered that the app itself was nowhere to be found in the iTunes App Store. It’s not even a mention anymore in my “bought” apps file bin in iTunes. It’s like it never even existed, and its loss saddens me. But, of course, I should know better. In this world of digital writing and composition (and art, and whatever else we want to call it) the only technology that really stands the test of time with any consistency is a piece of paper and a pencil or pen. All else is mostly temporary, so be sure to back your stuff up and keep an eye on the horizon for alternatives. In my mourning for Legend, I have been trying out a few different animated text apps. I grabbed a quote from Dave Cormier’s recent piece on Rhizomatic Learning. I’ll keep exploring. I am checking out Legend on my Android phone … hmmm … seems like it now has an entirely new name now (Animated Text), and has advertisements within it … and no longer has access to Creative Commons images. Dang. This exploration is another reminder to myself, and maybe to you, that nothing lasts forever in this shifting environment of operating system updates, app development, and that our own means and venues of digital writing is always in flux and motion. PS — I’d also like to say that I could probably do what I want with animated text via Keynote or Powerpoint (and I have) but I appreciated the ease of making animated texts with Legend and other apps. Maybe another post for another day is about what we give up as writers — creative control, freedom to make change, a vision from start to finish — when we allow our tools to guide our writing process. One of the writing tasks for students with our video game design unit (still underway) is to write a persuasive video game review, using a design lens (controls, audio, visual, playability, etc) as the lens in which to examine a game. It’s also a helpful zeitgeist moment for me, the adult in the room, on the trends of video games that young people are playing. 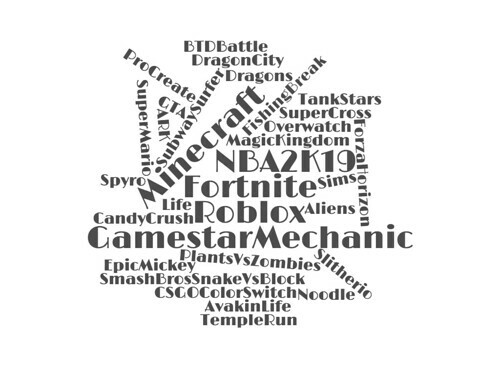 The word cloud above is a gathering of the titles of games my young writers chose to review. Fortnite, for sure, has the highest number of reviewers, over all, and it is a mix of girls and boys. Minecraft, for years the most-reviewed game, has slipped in popularity while Roblox has gained traction, mostly with girls, it seems. Gamestar Mechanic, which we use to make and publish games, was the default choice for those who don’t regularly play video games but still needed to write a review. I notice more kids writing about playing games on consoles (Xbox, etc.) than on mobile apps, which is another interesting shift I noticed this year. I’m not sure it is a trend or an indication of the increasing popularity of multi-player games, like Fortnite. Many students write about the lag time on big games like that, and how the lag makes for frustrating gaming. There always some video games that get reviewed that I don’t know about — Tank Stars, Fishing Break and Avakin Life, for example — so at least having these titles on my radar screen is helpful as I weave in game design with writing this time of year. I’ll be sharing out some of the reviews another day. The persuasive nature of video game reviews provides an opportunity for them to express their opinion about something, sometimes rather strongly (bad reviews of terrible games were as acceptable as good reviews), and to examine the genre of video game reviews. Many of students watch reviews on YouTube, which makes me wonder if I need to begin to adapt this assignment for video as well as text. 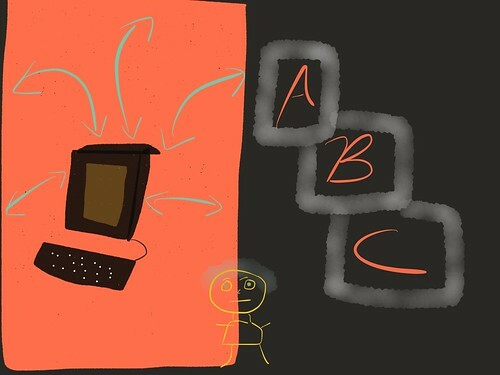 The image above seeks to represent a complicated idea — the merging of digital writing … through image. As part of a new push to explore Digital Writing (via the hashtag #MoDigiWriMo), I asked folks to share a wordless image to capture their view on digital writing. I know, strange, right? I then used the shared images from Terry, Wendy, Anna and Sheri to craft small poems, and then short musical interpretations of the image. I also began wondering if I could (but never wondered if I should) remix the four musical interpretations into one single composition, knowing the juxtaposition of sounds would be strange, weird, and challenging. I did it anyway, using Soundtrap as my mixing tool, creating this layered cake of sounds. The result is odd and disjointing, yet I find it intriguing (more so with headphones, where the shared landscapes are more likely to emerge). The one track that initially seemed out of sync was Sheri’s, so I ended up dividing it into smaller pieces, shifting it around as layers, finding the nooks and crannies for it. There are moments of confusion in the track. But there are also moments of melodic and harmonic symmetry, where each piece seems to fall into the others. Sort of like how we write sometimes, digitally. Vera Brosgol has mined her childhood (as part of a Russian immigrant family in the United States) for this interesting take on a common childhood experience: overnight summer camp. But in Be Prepared, Brosgol gives us a glimpse of something else, too: how Russian immigrants created an entire community here after the Purges to help children keep their Russian roots. I know this a reflection of the times we live in, but as I read Be Prepared, I couldn’t help thinking: is this story going to shift in some spy indoctrination story of young Russian children (Perhaps I’ve been watching The Americans too much and reading the collusion headlines of this presidency). But no. This is about a girl trying to find her own place in the world, where cultural clashes and family tensions make friendships difficult. This book was fun to read, and I really ended up caring deeply about the main character — Vera, a version of the graphic novelist, who tells us at the end that not everything here happened as it happened in real life. 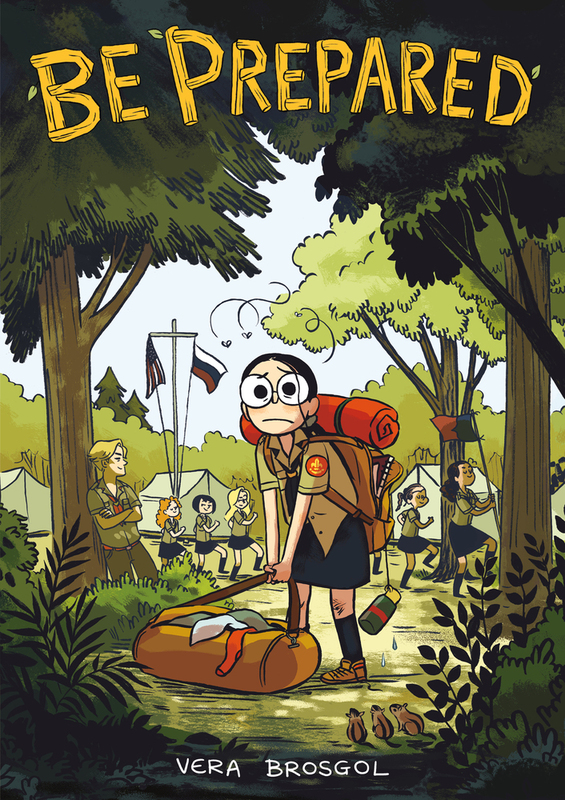 She’s funny, witty, creative and uncertain about herself, and in the end, she finds a friend and connection at the summer camp. This book is appropriate for elementary and middle school readers, for sure, and high school students might enjoy it. Brosgol is a graphic novelist/cartoonist to keep an eye on, for sure. I put out a call to some friends yesterday to visualize their digital writing, but without words. I was curious to what folks might do. Mine is above. As Terry, and then Anna, and then Sheri, shared their ideas, I started to think of how I might interpret their designs through poem and song. 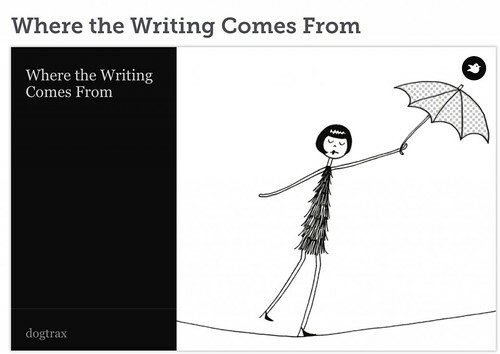 This part of an extended conversation about writing digitally (and you are invited). We are using the hashtag #modigiwri (more digital writing) on Twitter. I first used Sheri, Anna and Terry’s images for poems, adding words as a layer of interpretation, and then moved into capturing what I was seeing in their art into short song loops. It’s a musical interpretation of a visual idea about a writing concept. Which was an intriguing process, of looking deep into the images and trying to figure out, how do you capture an idea in music? I hope these three friends find my attempt interesting. If you share your image, I’ll do my best to do the same for you.